Joseph Michael Arpaio was born on the 14th June 1932. in Springfield, Massachusetts, USA of Italian descent. He is probably best recognized for being a law enforcement officer (LEO), and the 36th Sheriff of Maricopa County, Arizona, and also for investigating the birth certificate of US President Barack Obama. He is better known in the media as ‘America’s Toughest Sheriff’, who has published two books. His career has been active since the mid- 1950s. Have you ever wondered how rich Joe Arpaio is, as of late 2016? According to authoritative sources, it has been estimated that the total size of Joe’s net worth is over $500,000; his salary per year is over $100,000. This amount of money has been accumulated through his successful career as a law enforcement officer. Another source is coming from his career as an author. Joe Arpaio was raised by his father, as his mother passed away while giving birth to him. He spent his childhood in his hometown of Springfield, where he matriculated from high school, after which he worked at his father’s grocery store. When he was 18 years old, Joe went to serve in the US Army, and was in the Medical Detachment Division from 1950 to 1954, plus he worked as a military policeman. After he finished military service, Joe moved toWashington DC, and was hired as a police officer, then three years later moved to Las Vegas, Nevada. After a few months of devotion to the job, Joe became a special agent at the Federal Bureau of Narcotics, which became the Drug Enforcement Administration (DEA). He stayed with the DEA for the next 25 years, and reached the position of head of the DEA’s Arizona branch, which added a considerable amount to his net worth. Following his leave from the DEA, he worked as a travel agent in his wife’s Starworld Travel Agency, which sold passes for the Phoenix E space rocket. Although several flights were booked, none of them were ever realized. Nevertheless, Joe was first chosen for the Sheriff of Maricopa County, Arizona in 1992, and since then was elected five more times, until he lost the elections in 2016 to Paul Penzone, who will success him in January of 2017. His career has been long and successful, which only increased his net worth by a large margin. Beside that, Joe has published two books, “America’s Toughest Sheriff: How To Win The War Against Crime” (1996), and “Joe’s Law: America’s Toughest Sheriff Takes On Illegal Immigration, Drugs And Everything Else That Threatens America” (2008), the sales of which also increased his net worth. Although he is a sheriff, Joe has been sued several times for his behavior and controversies by government agencies and organizations, including the US Department of Justice, the American Civil Liberties Union (ACLU), the American Jewish Committee, etc, without any notable effect on his career despite several rulings going against him. When it comes to speak about his personal life, Joe Arpaio has been married to Ava since 1958. They are the parents of two children, and the grandparents of four. Their current residence is in Fountain Hills, Arizona. Place Of Birth Springfield, Massachusetts, U.S.
1 Advocate of illegal immigration enforcement. 2 Advocate of birth certificate enforcement. 3 Re-elected to his sixth term as sheriff on November 6, 2012. 4 Sheriff of Maricopa County, Arizona (1993-present). 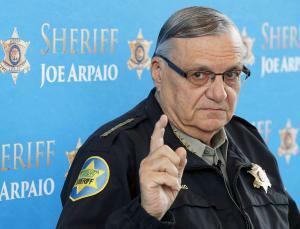 $500 Thousand 1932 1932-6-14 Actor American American Drug War: The Last White Hope (2007) Ava Arpaio Gemini Joe Arpaio Net Worth Joseph M. Arpaio June 14 Maricopa County Sheriff's Office Massachusetts Nicola Arpaio Paul Penzone Smile... You're Under Arrest! (2008) Springfield The Joe Show (2014) The War on Drugs (2007) U.S.